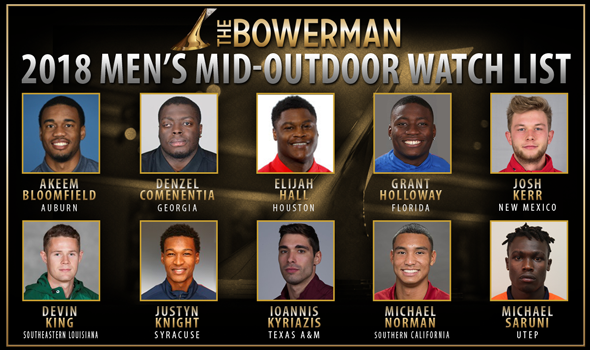 NEW ORLEANS – Parity continues to reign on the Men’s Watch List for The Bowerman. Two new faces joined the Mid-Outdoor Watch List for collegiate track & field’s highest honor – Georgia’s Denzel Comenentia and Southeastern Louisiana’s Devin King – bringing the total number of men who have been recognized this season to 21. Only four men have stayed on all five Watch Lists this season: Florida’s Grant Holloway, New Mexico’s Josh Kerr, Syracuse’s Justyn Knight and Texas A&M’s Ioannis Kyriazis. Devin King SR Southeastern Louisiana Pole Vault Kentwood, La. Also Receiving Votes: Rai Benjamin (Southern California), Tim Duckworth (Kentucky), Chris Nilsen (South Dakota), Kenny Selmon (North Carolina). Comenentia left his mark last month at the Clyde Littlefield Texas Relays. That’s where the Amsterdam native launched the hammer 76.29m (250-3) to become the ninth best performer in collegiate outdoor history. He currently leads the nation by more than six feet in his signature event and sits fifth and 16th nationally in the shot put and discus, respectively. King has improved quite a bit over the past year. The senior from Kentwood, Louisiana, sat out the indoor season and matched his PR of 5.70m (18-8¼) out of the gate at the Tulane Early Bird Invitaitonal. Four weeks later, King bettered his PR by two inches when he cleared 5.80m (19-0¼) at the Clyde Littlefield Texas Relays in a runner-up effort. King is tied as the seventh best outdoor performer in collegiate history. Holloway continues to shine during his sophomore year. This past weekend at the Tom Jones Memorial, Holloway scorched the track in the 110 hurdles with a time of 13.16. That left him tied as the No. 2 performer in collegiate outdoor history, tying him with Devon Allen and the record holder himself, Renaldo Nehemiah. Holloway bettered his PR in the event by 0.23 seconds and if he does that again, Nehemiah’s record of 13.00 would be long gone. Let’s not forget Holloway notched a mark of 8.00m (26-3) in the long jump and is a member of Florida’s top-ranked 4×400 relay and fifth-ranked 4×100 relay teams as well. Houston’s Elijah Hall claimed his spot on the Watch List during the indoor season and is right in the thick of things outdoors. Hall is currently ranked third in the 200 with a time of 20.11 and is a member of the Cougars’ 4×100 relay teams that own the third- and fourth-best times in the nation at 38.92 and 38.95. Southern California’s Michael Norman hasn’t run an open 400 yet outdoors, which is the same event he set a world record indoors, but his 200 time is among the national leaders. Norman ranks second in the 200 with a time of 20.06. He also anchored the Trojans’ 4×100 relay team to the second best time in the nation (38.88). UTEP’s Michael Saruni is ranked well in both the 400 and 800. Saruni clocked an altitude-converted time of 45.53 in the 400 at the Don Kirby Tailwind Open, which left him third on the Descending Order List, then followed that up with a time of 1:48.39 in the 800 the next week at the Texas Invitational, which puts him 17th. Knight and Auburn’s Akeem Bloomfield only have one meet under their belts this season. The former has the 10th best 1500-meter time in the nation (3:42.71), while the latter is ranked 15th nationally in the 400 with a time of 46.17. Kerr has yet to open his outdoor season, but will this weekend in the 1500 at the Bryan Clay Invitational. That’s the same meet where Kerr ran the sixth fastest time in collegiate outdoor history last year. Kyriazis is still in a holding pattern. There are three meets remaining on Texas A&M’s schedule for him to hit a qualifying mark in the javelin for the NCAA West Preliminary Round. It should be mentioned that Kyriazis now has 10 career appearances, making him the 15th man with double-digit nods. Southern California’s Rai Benjamin and Penn State’s David Lucas both fell off the Watch List, but Benjamin remains in the “Also Receiving Votes” category. Benjamin is joined by Kentucky’s Tim Duckworth, South Dakota’s Chris Nilsen and North Carolina’s Kenny Selmon. The next Men’s Watch List will come out Thursday, May 3. There are seven conferences that have athletes on the Watch List. If you add up the number of career Watch List appearances from The American, the ACC, Conference USA, Mountain West, Pac-12 and Southland, it totals 232, 12 fewer than the SEC by itself (244) … Georgia becomes the sixth program in Watch List history with five or more honorees, joining Florida (13), Texas A&M (10), Arkansas (7), Oregon (6) and Southern California (5) … Southeastern Louisiana is the 58th program to have a male athlete appear on the Watch List … Denzel Comenentia and Devin King are the 136th and 137th men in Watch List history to be named to the prestigious index.